Give outstanding education and childcare to your child at Dino Daycare & Preschool in National City, CA. Check out our bilingual program. Your child will be at ease in our daycare center. You can approach us for part or full-time day care. We’re flexible with parents’ schedules. Enroll your child in our daycare and preschool for an extraordinary learning journey. You can rely on us as we have a pull fire alarm and fire monitoring system integrated with National City Fire Department. With over 17 years of experience in daycare, this is our 3rd year in business. Your child can unwind in our CPSC compliant and ASTM compliant playground. We have three dedicated customer service phone lines. We also have central heating and air conditioning systems. 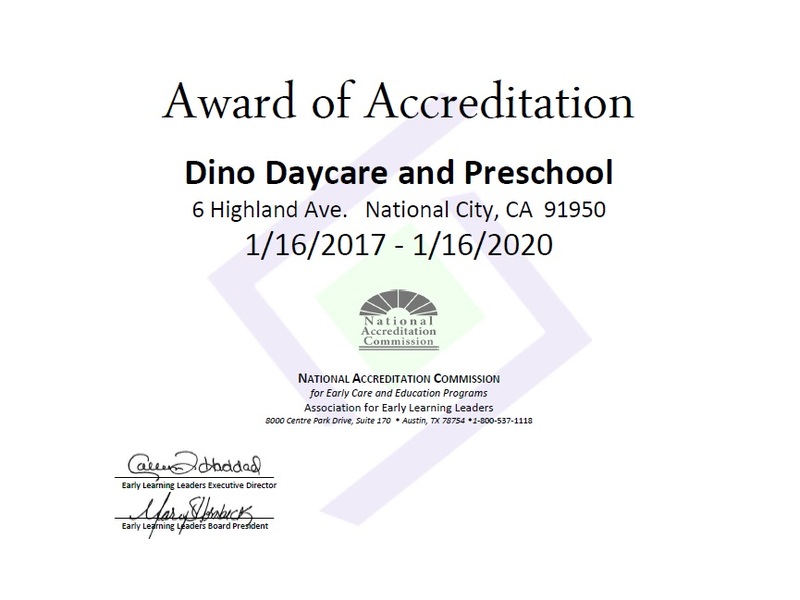 Dino Daycare and Preschool is proud to announce that it has received an Award of Accreditation from National Accreditation Commission in January 2017. We have bilingual program English-Spanish for children from 2-5 years old. We curently accept these programs: FEEA, CDA, TANF, YMCA, NACCRRA, CalWORKs Stage One Child Care, Navy Fee Assistant Program. Get 10% military discount with ID! Want to enroll your child in a school with incredible learning programs? © 2019 Dino Daycare and Preschool.